In a strange twist of fate, charges against Empire cast member Jussie Smollett were dropped Tuesday morning in a move stunning everybody. Smollett claimed he was attacked by two people wearing “Make America Great Again” hats on the morning of January 29, and said the men put a noose around his neck. Many felt there were inconsistencies in his story and Smollett later gave a raucous interview to Good Morning America where he defended himself. A few days later, Smollett was charged with a felony for what officials believing he staged the attack. Speculation centered on two Nigerian brothers who some believe Smollett paid to orchestrate the attack. But on Tuesday, all of those charges were dropped by Cook County prosecutors in a confusing decision. In a statement inside of the courthouse, Smollett thanked family, friends, and fans for their support, and also thanks the state of Illinois for “doing what’s right”. It turned out Smollett did some community service with the Rainbow/PUSH coalition for a few days leading to some speculation he might have admitted guilt, but stood by his story. The decision to drop charges did not sit well with Police Superintendent Eddie Johnson and a visibly angry Mayor Rahm Emanuel, saying it was a “whitewash of justice”. 20th Century Fox Television officially separated from its former Fox network sibling last week as The Walt Disney Co.’s deal to purchase most of 21st Century Fox was finalized. The decision of the Cook County State Attorney’s Office to drop charges is questionable – especially after the person who runs the office (Kim Foxx) decided to recuse herself from the case. 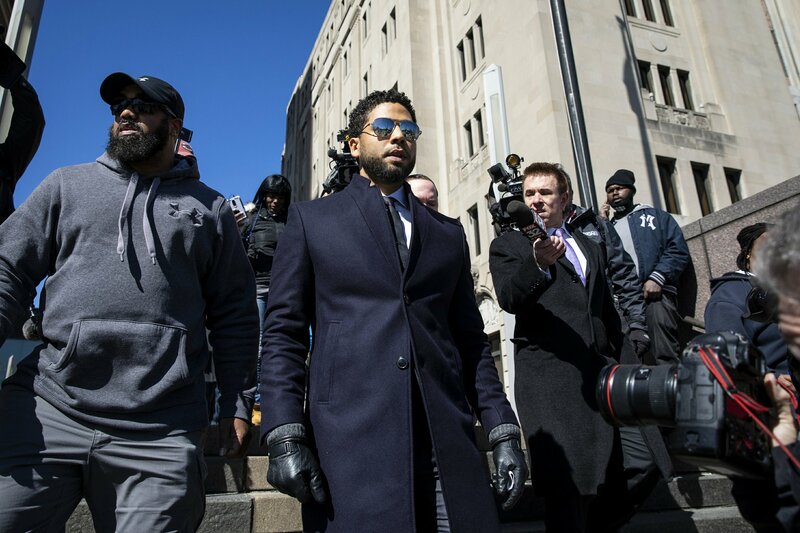 With his legal troubles mainly behind him, Smollett is cleared to return to work on Empire, which wrapped up filming on its fifth season last week. However, ratings for the show lost considerable steam since it returned from its winter hiatus, dropped to another series low in the 18-49 demo last Wednesday (1.1). On Monday, Fox renewed two dramas: 9-1-1 and The Resident – but not Empire. But with the Smollett case closed, a major hurdle was removed in terms of a sixth-season renewal. Even though ratings are down, the series’ ratings are on par with most prime-time series on broadcast network television. So while Empire is down, it is definitely not out.